BOONDHI LADOOOOOOOO name itself make us drowling, that to in orange colour will be my all time favorite. 'Yellow or orange' colour differs but taste remains same. 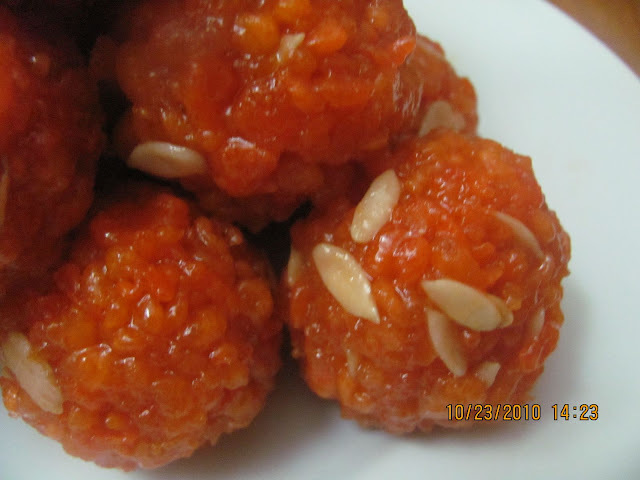 Amoung all Indian dessert Bundi ladoo owns it special place & it is all time favorite for everyone. I have given very easy preparation method that every one can follow. 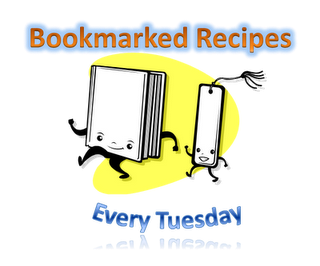 Try this recipe & let me know how it turned out for you. Mix sugar & water. let it boil till it reaches one- string syrup or sugar thermometer should read 218deg F. If we take sugar syrup & drop on a plate, it will stand like a pearl, it should not run. At this stage remove the syrup from heat & keep it aside. If we mixed this temperature then our ladoo will be very hard. 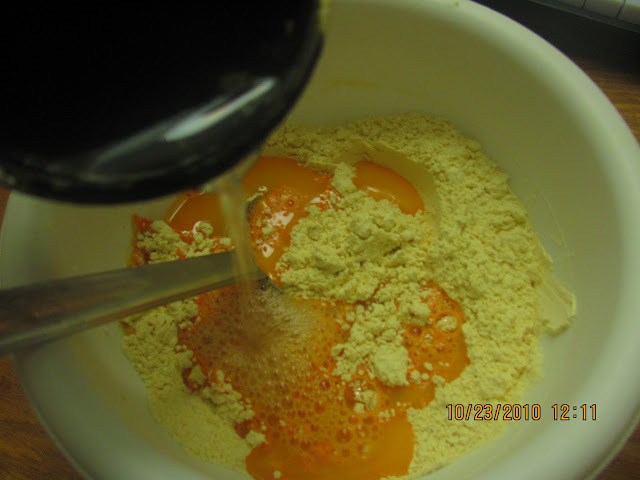 Mix Besan, cooking soda,orange colour, salt & rice flour. 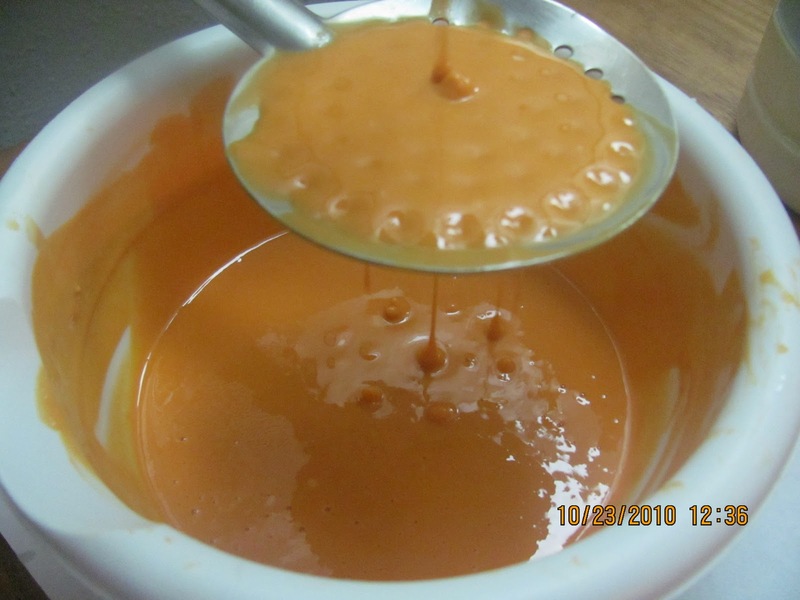 Add 1 cup of water to it & whisk very well to form a bajji batter consistency. I added additional 1 tbsp water to bring it to a correct consistency. 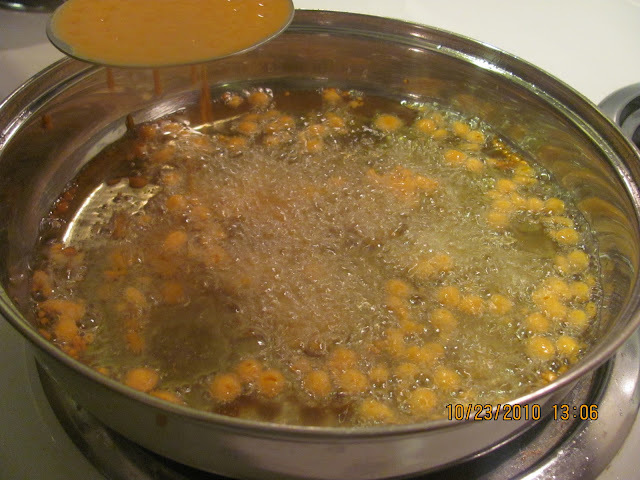 We can check the consistency by pouring the batter in skimmer , it should not drop very fastly then our boondhi wont be in round shape n﻿or it should not drop very slowly then batter is very thick then we will get thick boondhi which is not good to make ladoo. It should pour in medium speed. Take a wide mouthed frying pan and pour oil upto 1-1/2 inch ﻿of the pan & heat it in medium heat..
Drop a batter in the oil, if it rise immediately without changing colour then oil is ready for frying. 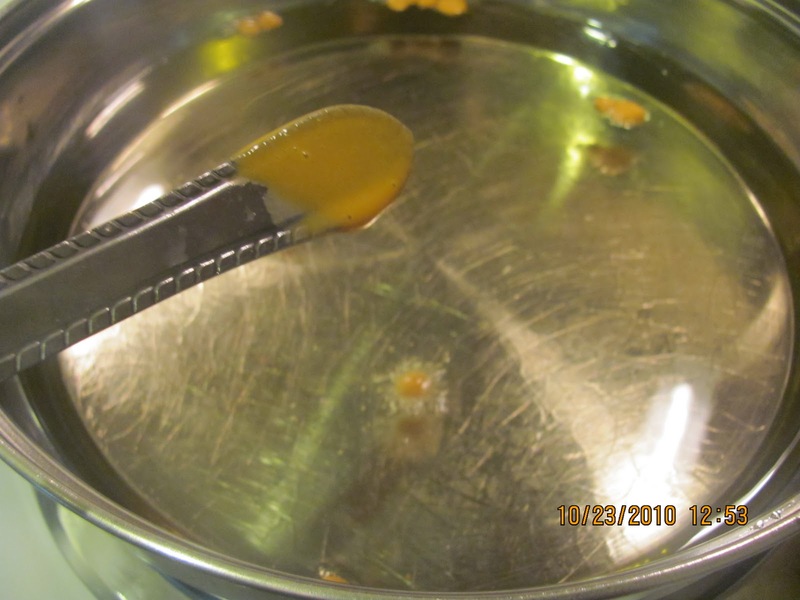 Hold the skimmer for above 1-2 inches from the oil over the frying pan with one hand. 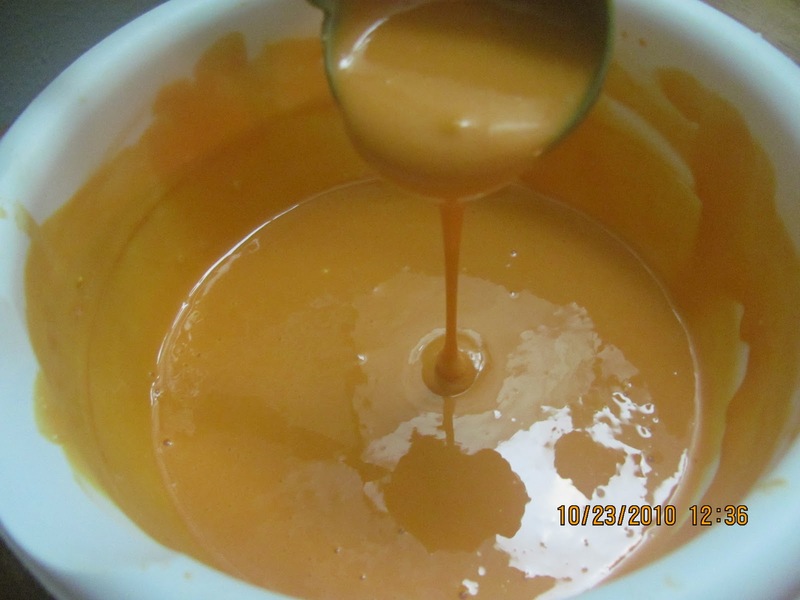 Pour some of the batter onto the skimmer with other hand. Make sure batter cover all of the holes without spilling over the edge of the skimmer. Dont hold the skimmer more than 1 1/2 inches above the oil, then boondhi wont be in round shape. Fry the boondhi untill the sizzling sound stops and take the boondhi out when they are slightly golden colour Put it in the warm sugar syrup directly. Dont fry boondhi till crispy then ladoo wont be soft. Before making next batch of the boondhi, wipe the skimmer clean. Repeat the process with rest of the batter. Let Boondhi soak in the syrup for 10 mins to 15 mins. Add crushed Cardamom powder, melon seeds, ghee & mix it well. Dont cool off the bundhi mixture, then it will be hard to shape it. When the boondhi mixture in warm, take a scoop full of boondhi mixtrue into your palm & gently squeeze the mixture between the palm to make a round ball shape. Drain the excess syrup while squeezing. Follow the same step with the rest of the boondhi mixture. 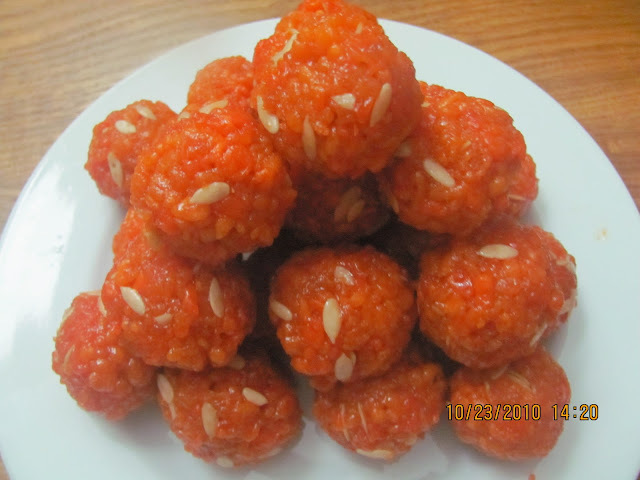 When the ladoo cool off it will become soft & moist. Keep it in air tight container for 10days. Can be stored in refrigerator for more than 20 days. Also..This is my first visit to your blog you have a nice collection..I'll be back often..
Hi Thanks dear because of you i cannow makee @least boondi . you have given perfect measurement . 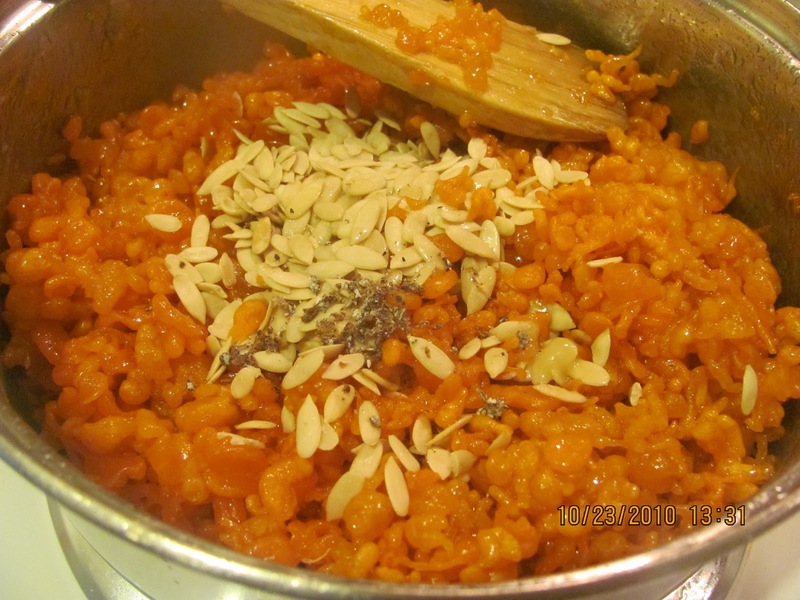 i will definetly update you mext time when i will make ladoo of this boondi. Did you know you can shorten your long urls with AdFly and make cash from every click on your shortened links.